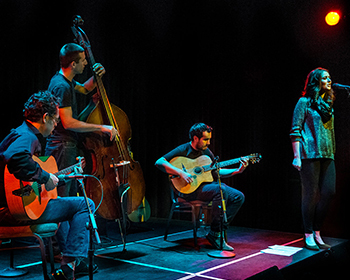 NVJS welcomes back the dynamic gypsy jazz group! One evening with Ultrafaux & Hot Club of Baltimore demonstrates why jazz has been so irresistible to listeners all over the world. These musicians can handle the complexities and breakneck speeds of Roma swing, but what makes Ultrafaux really special is that they play original music. We can come close to the experience of what it must have been like to hear Django Reinhardt play ‘Minor Swing’ for the first time in 1937. Ultrafaux’s original compositions compare favorably to classic Hot Club tunes. They update the tradition and bring the swing into the 21st century.